Another week with another new Windows 10 Insider Preview Build from Microsoft, this time Microsoft brings Build 16188 for PC and Build 15210 for Mobile to Windows Insiders in the Fast ring. 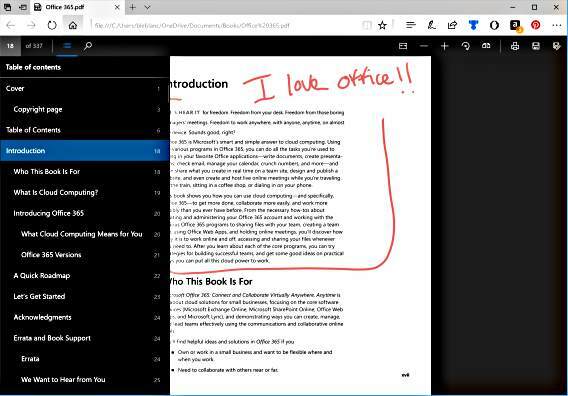 Windows 10 Insider Preview Build 16188 bring lots of new awesome features and improvements or fixes for PC such as Microsoft Edge’s PDF Reader, Windows Defender Application Guard for Microsoft Edge is now available, and more details check below. If you’re on the Fast ring, the Build should be available for download, or head to Settings > Windows Update > Check for Update. PDF Form filling: Every now and then we encounter forms to be filled which are in PDF format. Now you can fill in PDF based forms within Microsoft Edge, save them and print them! PDF Annotations: The annotations capability in the browser is now extended to PDFs as well. You can use the “Make a Web Note” button on the top right of browser frame to invoke an annotations bar. Table of Contents for easier navigation: For reading longer documents, you can now use the Table of Contents (ToC) feature for easier navigation. You will see the ToC button on the left of the PDF toolbar if the document has ToC defined by the author. Click on any heading in the side pane to navigate to that part of the document. Better viewing and navigation: Sometimes PDF documents, such as documents that are copies of documents scanned in, are not in proper orientation and need to be rotated to view them properly. Now you can rotate the PDF documents for better readability. Look for the rotate button in the toolbar. Also, it is important to be able to adjust the reading layout of the files to best suit user’s needs based on the screen size, type etc. Using the “Layout” flyout menu on the toolbar, now you can switch from one page to two page layouts and change to page-wise scrolling for better navigation experience for longer documents. Windows Defender Application Guard: Announced last September in the Microsoft Edge Blog, Windows Defender Application Guard for Microsoft Edge is now available in Windows Insider Previews for Enterprise users in the Fast Ring. – – Microsoft Edge running in Application Guard provides enterprises the maximum level of protection from malware and zero day attacks against Windows. Ninjacat Icon for Windows Insider Program in Settings: Check out the new Ninjacat icon representing the Windows Insider Program under Settings > Update & security > Windows Insider Program. Cortana’s settings have been integrated into Settings: Cortana is a core component of Windows and users look to the Settings app to find Cortana’s settings. We’ve heard your feedback about discoverability, and with this build, we’ve made the change to migrate all of Cortana’s settings into Settings. You can access them by clicking the settings gear in Cortana, going to Settings > Cortana, or just searching for the setting you’re interested in. Improving your update experience: We’ve heard your feedback, and with Build 16188 we’ve replaced the previous modal Windows Update dialog with a new interactive toast notification so you can easily be aware of an available update without it interrupting your work. Try it out next time you get an update, and as always, please share your feedback! We fixed an issue where explorer.exe would crash and restart if you tapped any of the apps listed in the Windows Ink Workspace’s Recent Apps section. Double-clicking the Windows Defender Security Center icon in the notification area will now open Windows Defender Security Center. Universal dismiss of Cortana reminders is now enabled across Windows devices on this build or higher. To learn more about universal dismiss and how apps can enable it check out our blog post here. Localized apps on localized x64 Windows 10 Insider Preview builds will now work. We believe this will also address the issue some Insiders were reporting where the Open and Save dialogs weren’t opening in certain desktop (Win32) apps. We fixed an issue resulting in decreased Action Center reliability in recent flights. We fixed an issue with the Chinese Pinyin IME where typing a sequence of characters beginning with ‘hu’ into certain apps would result in an unexpected delay before the candidate window updated to reflect the current composition. PC Reset via Settings > Update & security > Recovery will not work on non-English Insider Preview builds. Some Insiders have reported seeing this error “Some updates were cancelled. We’ll keep trying in case new updates become available.” in Windows Update. See this forum post for more details. Navigating to Settings > Update & security > Windows Update may crash Settings app. You can simply re-open the Settings app again and it should work again. Navigating to Settings > Personalization > Lock screen may crash Settings app. Your PC may hang when shutting down the PC. In certain cases, Start may fail to launch but launches normally on the second try. ADDED 5/5: The Settings app crashes on launch if you use certain display languages, including Russian, French, Polish and Korean. We’re investigating. ADDED 5/5: The XAML designers in Visual Studio and Blend for Visual Studio show an exception when a XAML file from a Universal Windows Platform project is opened. We fixed an issue with the Glance screen where the time was not updating. We fixed the token issue so when your device syncs to the service, text messages should show back up. The copyright date is incorrect under Settings > System > About. It shows as 2016 when it should be 2017. Thanks to the Windows Insiders that reported this!